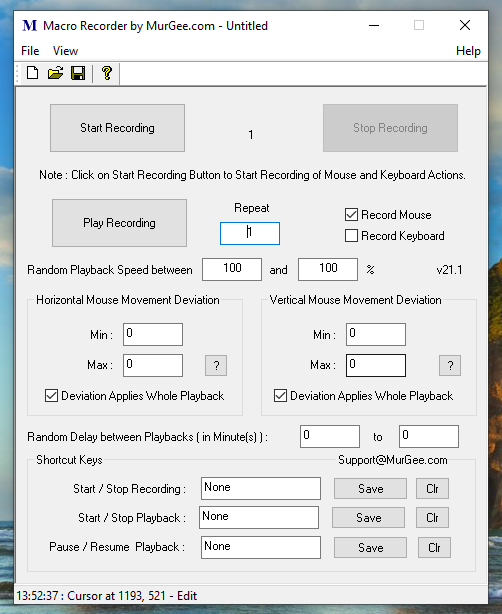 Record and Playback Mouse and Keyboard Actions with Macro Recorder. All Mouse Actions such as Mouse Moving, Mouse Dragging, Mouse Clicking with any of the Mouse Buttons, etc can be recorded with this Macro Recorder. Keyboard Actions can also be recorded and yes you can even record Mouse and Keyboard Combined Actions such as Ctrl +Click, Shift + Click and everything else with this Easy and Simple to use Macro Recorder. Download and try this Macro Recorder for Free on your Microsoft Windows Computer running Windows 7 or Later Version. There are no functional Limitations in this Free Trial of Macro Recorder. Once the trial usages have been used, you can register your software and unlock the trial limitations of the software. Given below are few features of Macro Recorder which make it the best Macro Recorder. Yes this Macro Recorder is in Active Development State and Suggestions are Welcome to add extra features in the software. This Macro Recorder can Record all types of Mouse Actions such as Left Click, Double Click, Middle Click, Ctrl + Click, Shift + Click, Drag and Drop using Mouse, etc. All Keyboard Activity is recorded in perfect order by this Macro Recorder. Whether you are using En English or Non-English Keyboard, this Macro Recorder can Record all types of Keyboard Activity. The Recorded Mouse and Keyboard Activity can be stored in a Macro Script File which can be later Loaded into the Macro Recorder to be Played back. Configurable System Wide Keyboard Shortcuts can be used to Control Recording and Playback of Mouse and Keyboard Actions. This Macro Recorder is really Simple to Learn and and Use. The Screenshot above Displays the Main Screen of the Macro Recorder with few Buttons and Configurable Keyboard Shortcuts. You can use this Macro Recorder on 32 bit or 64 bit versions of Microsoft Windows. The Macro Recorder works on Windows 10, Windows 8.1, Windows 8 and Windows 7. You can Download and try out this Macro Recorder for Free. Watch a Short Video Tutorial of Macro Recorder which displays how to use the Macro Recorder. The Video Tutorial has been Recorder on a Windows 10 Computer, however the procedure to Record and Playback the Recorded Macros with Macro Recorder is the exact same for other supported versions of Microsoft Windows such as Windows 8.1, Windows 8, Windows 7, etc. Please do Send us an EMail at Support@MacroRecorder.biz with your Query, Suggestion or anything else. We do reply to all Emails within less than 24 Hours. Visit MurGee.com to Download more Mouse and Keyboard Automation Software Applications.